Wearable devices like a smartwatch fitness rings and began flooding the world markets. Until now, there have been several manufacturers that carry the compromised on the market to attract the interest of users who want to perform sophisticated styles at once. 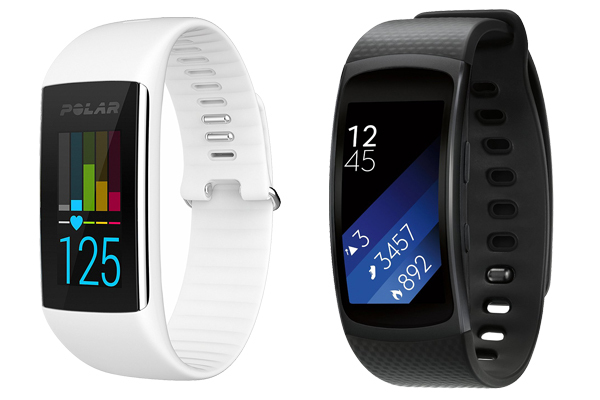 For example Polar A360 vs Samsung Gear Fit 2. Who are the top winners of this competition? This is the purpose of comparison with the making of these 2 smartwatches article. The title was Polar A360 vs Polar A370 before we make this another review, you can check it directly. The Polar 360 is known with as a slim and modern fitness tracker with features RGB touch screen can deliver a trio of other features like step counting, smart notifications, and wrist-based heart rate monitoring in a case which is water resistant standing up to 30 meters, so that you can swim and wash your hand without any worries to your watch in wrist. It is also equipped with a quiet and vibrating alarm that has the ability for tracking many kinds of activities at the swipe of a finger only. By the way, The RGB touch screen of Polar A360 has a half inch with 80 x 160 pixels resolution. The band features one small button on the lower left side covered by the sillicone strap and it has 5 color choices, consist of powder white, charcoal black, and sorbet pink with neon green, and navy blue. All of them can be easily switched by popping the A360 out of one and into the other. Heart rate is tracked with an optical monitor on the back of the watch. Those who prefer a classic Polar cloth heart rate strap can also connect one via Bluetooth. The time appears automatically any time the wearer’s wrist is moved in a “checking the time” motion. If that doesn’t work, the time can also be displayed by pressing the button. Once it appears, you can scroll through it by sliding a finger up or down on the screen bringing up three options: My Day, Training, and My Heartrate. Samsung Gear Fit 2 is smartband the hosts Samsung that runs using OS Tizen. Gear Fit 2 has some features that are devoted to fitness activities such as tracking steps, calorie counters to the scanner’s heartbeat. As a device specifically used for sporting activities, the features that are available of course will be very helpful to users in many kinds. Provided with a heart rate sensor and also features waterproof, Fit Gear 2 to Accessories that can be used in various types of fitness activities. Both indoor and outdoor sports. Design of Gear Fit 2 simple enough certainly. With a strap made from rubber and the main device is wrapped using Polycarbonate material. In the built quality looks sturdy and have a solid weight. Gear Fit 2 capabilities were designed with waterproof and dust with IP68 certification. IP68 certification which indicates that the device can be used to the maximum depth of the dive in the 1, 5 m for 30 minutes. Gear Fit 2 using the operating system OS which is partially Tizen Samsung. Provided with a Curved screen Super AMOLED 1.5 inch resolution 216 x 432 p, 1 GHz processor, 512 MB RAM and 4 GB of internal memory. Gear Fit 2 equipped with a battery capacity of 200mAh. For device tracking system using GPS location technology, GLONASS. Sensors embedded in the Gear Fit 2 including Accelerometer, Gyroscope, Barometer, and Heartbeat Sensor. So, which one is suitable for you? What is Polar A360 vs Samsung Gear Fit 2? Depending on the allocation. Galaxy Gear Fit 2 has many functions, start print notification, to answer calls. Same thing with Polar A360. It’s so hard because in terms of design is also almost the same. If you are already in love with Samsung because you also even users of Samsung to smartphones, it would be better if the smartwatch you also with the same brand.